You reach the top of the LADDER after what seems like a whole WEEKEND of climbing and climb out of a HINGED GRATE into a CONTROL ROOM. It kinda looks like the one you saw through the WINDOW in your ROOM, back an hour or so ago. On the wall are a series of SCREENS. There is also a BUTTON, labeled "EMERGENCY EXIT." This one has not been pressed via an elaborate series of INVENTORY MANIPULATION EVENTS, nor pressed in any other fashion (I mean, really, since we're on the topic and all). Oh, it's another ROOM kinda like yours.... Hmm. This one still contains a BED, TABLE, HEART MUG, and GO SIGN, but that's about it. There's RED WRITING all over the WALLS and FLOOR. 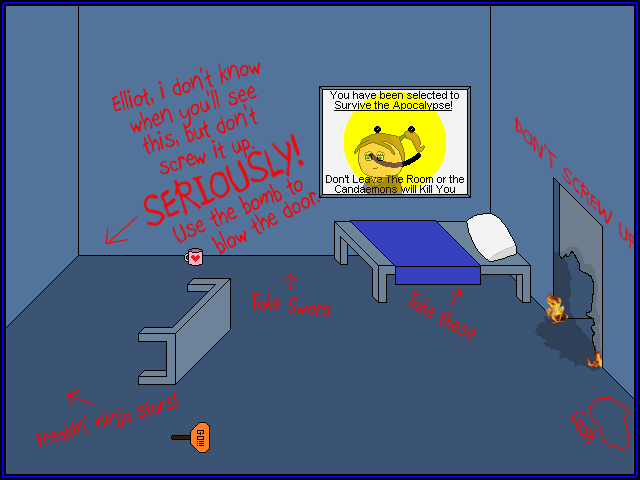 It's kinda obvious that this was the LATE ELLIOT'S ROOM. His ROOM's DOOR is partially blown up. Also, partially on fire. Hmm. Curiouser and curiouser. Why the heck didn't he take the HEART MUG and GO SIGN? Was his INVENTORY full? Who would leave behind perfectly useful stuff like that? Well, you're still in the CONTROL ROOM. What do you want to do? Check the vent in the control room. Enter the room through the still flaming door. Check under the bed, sheets, and in the pillow case. Check the coffee mug. That vent is the GRATE that you just crawled out of, silly! There's just a really long LADDER there. bust out leet hacking skills to find out stuff on the computer!